Creazy Homemade Whipped Cream Maker | Gardens Alive! Whether you're a baker or a berry grower, this homemade whipped cream maker is for you. Simply fill Creazy's jar to the line with heavy whipping cream, sugar and a touch of vanilla, if desired. Next, add the Silicone Agitator Balls, shake, and in a minute or less you've got homemade whipped cream that's thick and fluffy. Easily adjust the texture by shaking for just a few seconds more. Spoon over fresh berries, shortcake, or any dessert you desire. Creazy is as fun as it is ecological, and it's also the perfect gift for your favorite foodie. 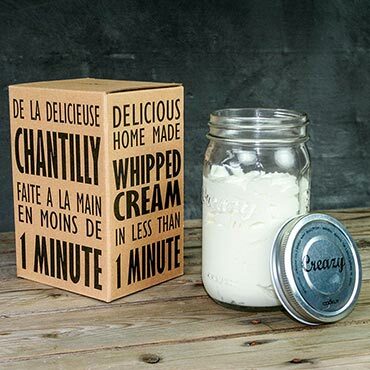 Store whipped cream in the shaker jar for multiple uses, if it lasts that long! Kids love it, too.